Plantronics' new cordless phone headset series is the no-hassle solution at Telephone Magic for fitting more wireless headsets in the same office. 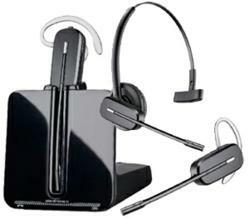 Wireless phone headsets have been getting more popular in business offices in recent years. Unfortunately, this has caused a new problem for communication managers. Whether you utilize Avaya, Nortel, Cisco, Mitel, NEC, Panasonic, Toshiba, or any other business phone system telephones, as more wireless headsets are added, the density, or concentration of these headsets can cause interference or "crosstalk". In many instances, as the problem increases, businesses have to abandon their more convenient wireless telephone headsets and move back to traditional corded headset models. Plantronics, widely viewed as the leader in business phone headsets, has released a new wireless headset line, CS500-XD high density cordless headsets, which solves the problem of too many telephone headsets in a limited office area. 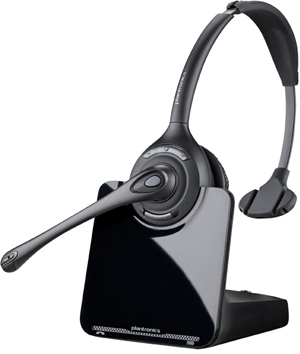 Models such as the CS540-XD cordless headset offers all of the convenient features of the lightweight CS540 convertible wireless headset, with the ability to utilize many of them in a high density office environment. Telephone Magic Inc., a long-time online leader in Plantronics headsets, is thrilled to see the release of the new high density line. Jeff Jackson, president of Telephone Magic, notes the new CS500 XD headset series is "A great move by Plantronics which will allow our customers to purchase more wireless headsets for their busy call centers, contact offices, and product support buildings. With the XD models, we will no longer have clients reporting issues with call interference when they add a high volume of wireless headsets to a concentrated area". The CS500 XD wireless headset line represents the ho-hassle, high-quality solution for fitting more wireless headsets in the same office. Says Jackson, "What makes it work is that unlike the CS500 line which utilizes DECT 6.0, 1.9 Ghz technology, the XD wireless headset series uses the 900 Mhz frequency which allows for more headsets in the same area without calls at different desks causing crosstalk. These headsets maintain clear conversations, offer extraordinary sound quality, have a range of up to 350 feet, and the CS545-XD wireless headset even offers a convertible headset with a hot swappable battery for unlimited talk time". 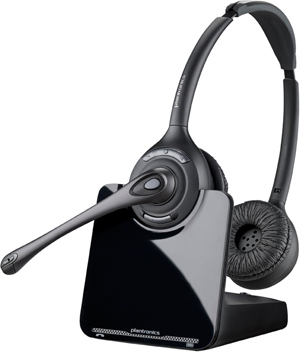 All of the CS500 XD series cordless headsets provide one-touch call answer/end, vol+/-, and mute capabilities. The CS500-XD system also enables users to conference in up to three additional XD Series headsets for easier collaboration. 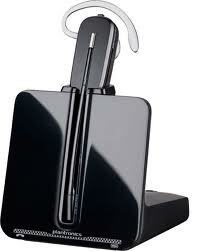 Guest headsets can also subscribe to a base by simply docking the headset. By adding an Electronic Hook Switch Cable or Handset Lifter, phone agents can also remotely answer/end calls. Designed for extreme density environments, the CS500 XD Series features 900MHz technology that allows businesses to deploy more wireless headsets in a specified space. Managers have a choice of narrow or wideband professional grade audio quality by choosing narrowband to extend talk time or wideband mode to enable clearer conversations. An extended boom and noise-canceling microphone filter out background noise, so listeners can hear conversations clearly, and enhanced Digital Signal Processing (DSP) provides more natural sound, delivering clear audio the way it’s intended to be heard. The CS500 XD Series offers users a choice of three comfort-tested wearing options to match personal preferences. The CS540-XD and CS545-XD features a convertible headset that allows users to choose from over-the-ear, over-the-head, or behind-the-head styles, although the last option requires a neckband which is sold separately. The CS510-XD wireless headset features an over-the-head monaural style which covers one ear for comfort and awareness of environment. Finally the CS520-XD cordless headset offers an over-the-head binaural style which covers both ears for comfort, focus and blocking out background noise. Aside from the convenience of so many different wearing styles, Jackson notes, "There is even a sleek charging base included with the CS500 XD Series. An adaptive power system optimizes for range and talk time by automatically downshifting to low power when the headset is close to the base to save battery life. It's just more proof that Plantronics leads the way in business phone headset technology and another reason to invest in XD wireless headsets when you need to have a lot of them in a concentrated area". CS540-XD wireless phone headsetPlantronics CS540-XD cordless headset is the high density wireless headset replacement of the legendary Plantronics CS50 phone headset. CS520-XD wireless phone headsetPlantronics CS520-XD cordless headset is the high density wireless headset replacement of the legendary Plantronics CS361N binaural (2-ear) phone headset. CS510-XD wireless phone headsetPlantronics CS510-XD cordless headset is the high density wireless headset replacement of the legendary Plantronics CS351 monaural (1-ear) phone headset. CS545-XD wireless phone headsetPlantronics CS545-XD cordless headset is the high density wireless headset replacement of the legendary Plantronics CS50 phone headset.